This game is mentioned in many activity books of the time period for both boys and girls. The game can be played on a variety of levels but all use the same rules. The two players set up their pieces and then manuver on the board, being able to remove one of their opponent's pieces under certain conditions. 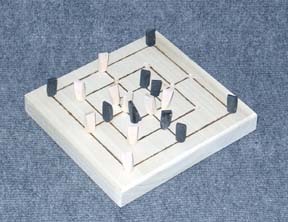 Play continues until one player is reduced to just two playing pieces left. The cost of Nine Man's Morris is $15.00.